1. 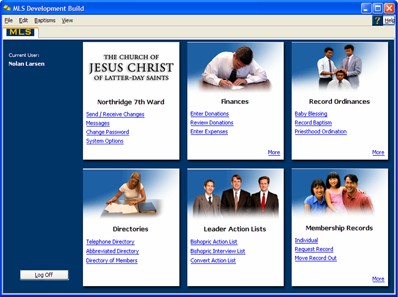 Record member ordinances (e.g., baptism/confirmation) and activities (e.g., marriage). 2. 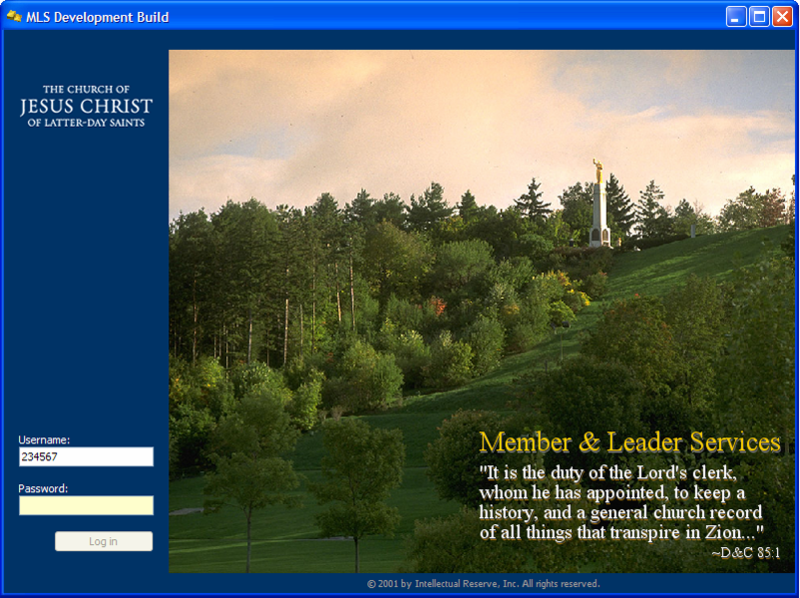 Provide tools that support local priesthood and auxiliary leaders in their member-nurturing responsibilities. 3. 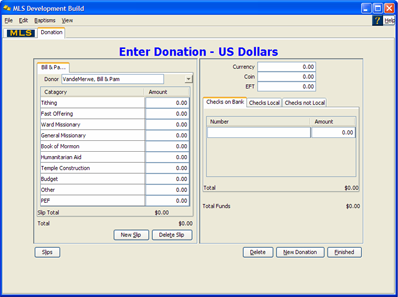 Record member donations and manage local unit finances. 4. Support mission convert information reporting requirements. 5. Support multiple languages and writing systems. Also, an analysis of local infrastructure and security issues was made during these visits (e.g., Web availability, telephone infrastructure, building security, electrical grid, etc.). Two primary architecture designs were considered for MLS development: Web-browser based or a stand-alone Java application. After seeing the limitations of computer skills in local units and the poor communications infrastructure in many international areas (e.g., lack of Web access and poor telephone infrastructure), it was decided to develop MLS in Java. The remainder of 2000 was used to research and prototype MLS. Significant development began in 2001. 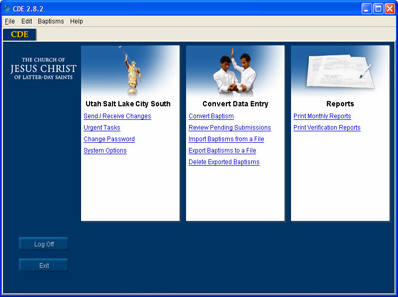 CDE (Convert Data Entry): To be used by missions to submit convert information needed to create a membership record, replacing the current DOS CDE version. MLS 1.0: To be used by selected international local Church units, this phase provided basic membership and finance functionality. This would be the first local unit software made available to units outside of the U.S. and Canada. MLS 2.0: To be used by all authorized local Church units. MLS 2.0 provided full membership and finance functionality, replacing MIS and FIS in the U.S. and Canada. CDE and MLS 1.0 development started in early 2001. CDE shipped during October 2001. MLS 1.0 shipped during February 2002. MLS 2.0 shipped during December 2002. CDE was the first product to come out of the MLS project. 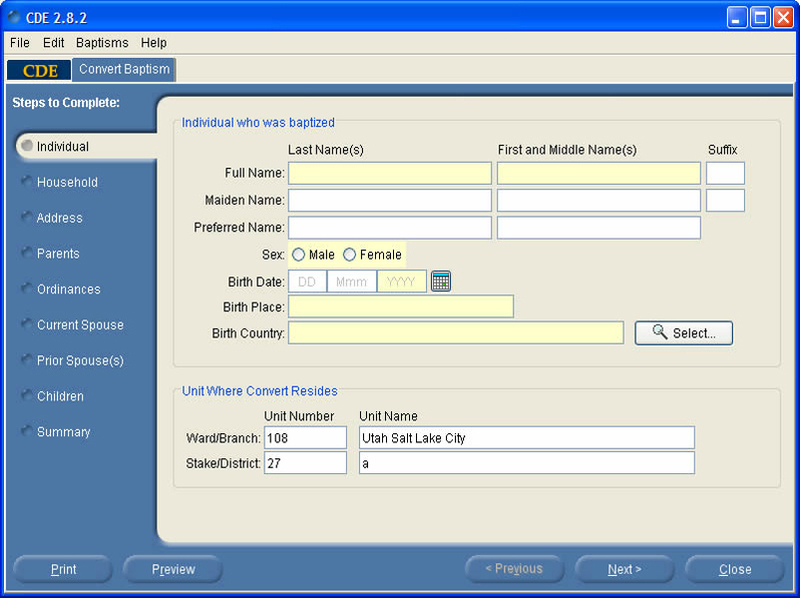 CDE is used to record and submit convert information needed to create membership records. 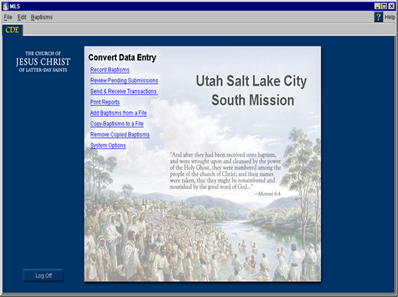 It is also the vehicle used to report a mission’s official monthly baptism and confirmation statistics back to a mission. It was written entirely in Java using the JVM 1.4.0. CDE 1.0 was piloted in two missions in October 2001. In February 2002, CDE began full rollout to all missions. 1. 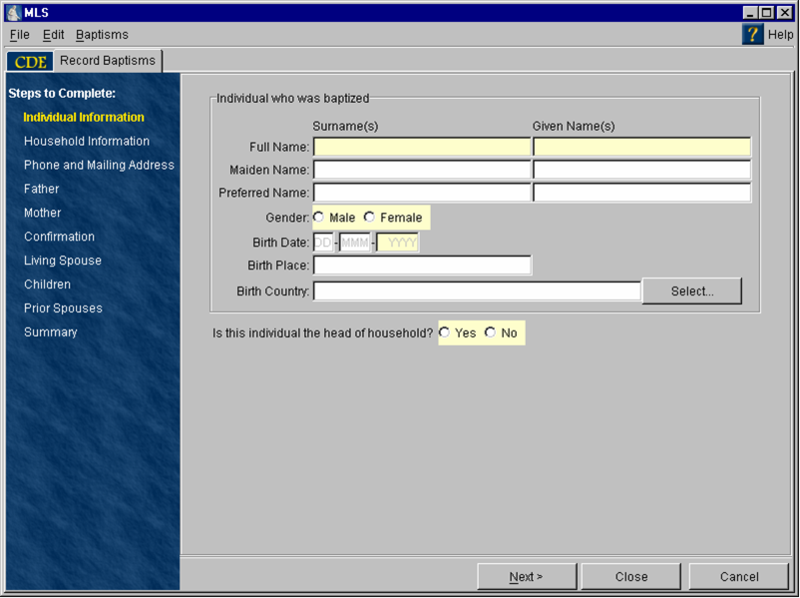 An application written in Java. 2. A database written in Java (from Pointbase). 3. 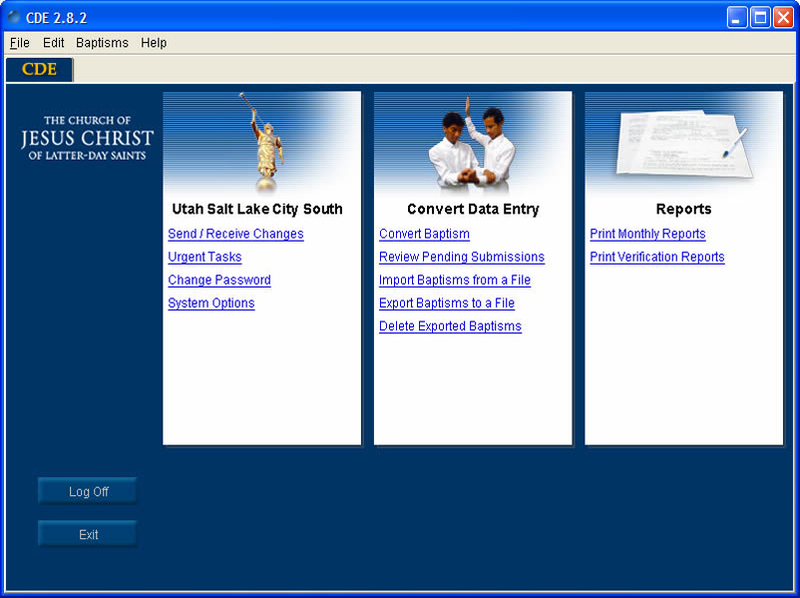 An interface to submit convert membership data to the Church Membership Information System (CMIS). CMIS is the system that manages individual Church member information and is the official repository for all membership information. 4. Used Afaria instead of the RemoteWare that MIS and FIS used. Today CDE is used in 318 of 346 total missions. CDE is not used in non-proselyting missions or missions whose language is based on non-Roman writing systems (e.g., Cyrillic). The current version of CDE is 2.8.2 using the JVM 1.6.0. After the CDE pilot was successfully completed, MLS 1.0 was well into development. 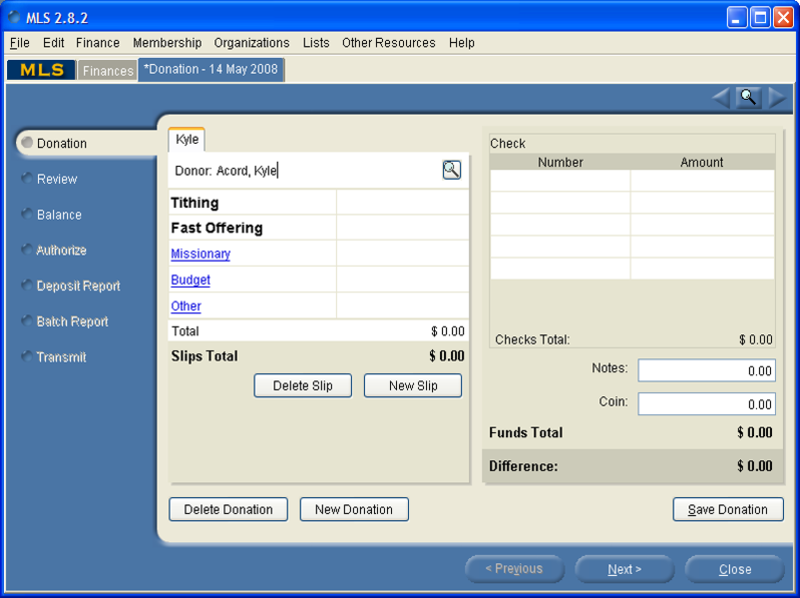 MLS 1.0 was planned to provide basic membership and finance functionality that would be used in international units where they previously had no local unit computers or software. MLS 1.0 first shipped in February 2002 to selected stakes in Australia and New Zealand. MLS 1.0 used the JVM 1.4.0. MLS 2.0 added functionality provided by MIS and FIS: home and visiting teaching, organization information, certificate printing, temple recommend tracking, stake functionality, check writing, and budgeting. MLS 2.0 was to begin the replacement of MIS and FIS in four pilot stakes in Utah in December, 2002. By June 2003, MLS 2.0.4 began shipping to all domestic units. As of June 2008, the current MLS version is MLS 2.8.3. It uses the JVM 1.6.0. 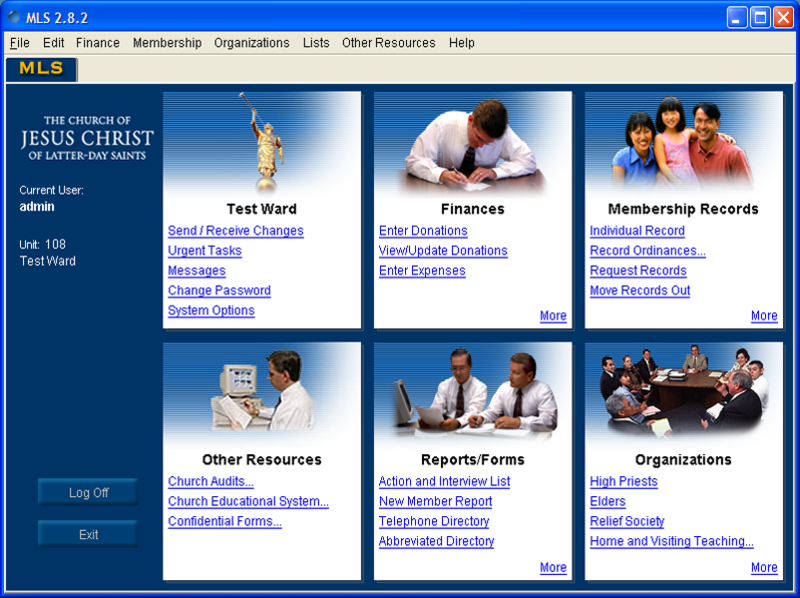 MLS is used in 90% of all Church units, in 65 countries. MLS supports 17 languages and four writing systems. Four languages and two additional writing systems will be added during 2008. From its simple beginning to today, MLS's functionality has grown beyond its original membership and finance roles. As for the future of MLS, additional functionality will continue to be added as needs change and as directed by priesthood councils. Larry Jones is a senior business analyst for the Church. 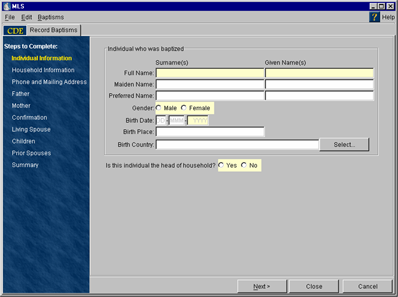 MLS 2.0.f or was in use in Cape Town, South Africa in 2001. I really enjoyed being part of the pilot phase! 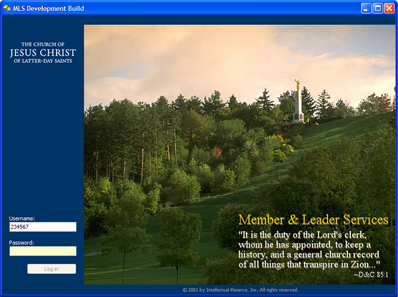 I don't recognize the picture of shown Cumorah - I think it was Jesus Christ holding a lamb. Is there a fuller history of membership and financial accounting procedures? What functions did MIS and FIS have and what type of record keeping did it replace? As a member of a bishopric I used MIS in Cape Town by special concession in about 1996. I recognised that staff at the Area Office were having to deal with handwriting, and geographical names that were not familiar to them and introducing a lot of errors. By using MIS I would send a computer printout to them and then they would capture the information from clear print, and I would then update MIS manually. This made a dramatic difference to the accuracy and effectiveness of keeping the records updated. A real bonus was being able to use the membership information in the home teaching component of MIS, such that all improvements to the accuracy of the information was immediately inherited by the home teaching. I encouraged using nothing but MIS so that all attention went into keeping the MIS information accurate and not trying to keep a home home-baked home teaching system up to date at the expense of updating the information at Headquarters. That worked well. Then as a stake clerk I obtained permission to have an MIS database for every unit. I would do all of the updating and send backup files to the Area Office who would then send me backups to update my MIS databases. A bit restricted, but still much better than the paper systems used before. Then came MLS - and almost everything that we were doing in MIS, and everything financial was being done online via dial-up modem. Then if the records were inaccurate it was because the clerk messed up and could not blame anyone in the Area Office. Putting the power in their hands was a great blessing to the work in Cape Town. And now MLS has grown tremendously. It is great to be able to use it to keep the records in so much better state than it was possible to do even with great diligence. Well done to the leaders and developers for the great work from which we all benefit in the Work of Salvation.